This week, a 3-decade old event returns to Oklahoma City, a film auteur’s vision gets a facelift for the stage, an art museum screens short films from a film festival, the rodeo returns to Oklahoma and an exhibition featuring state artists opens. 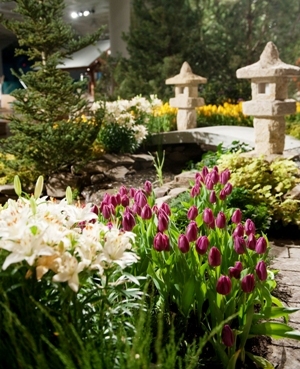 The Oklahoma City Home and Garden Show returns for its 31st year this weekend at the State Fair Park. Show attendees will be able to browse through over 400 exhibits showcasing everything from home décor to land ornaments. This time around, celebrity landscaper and former host of HGTV’s series Yard Crashers Ahmed Hassan will be there, along with vocalist and guitarist Victor Andrada. Andrada will be performing his songs throughout the weekend. The Alfred Hitchcock film “39 Steps” makes its debut at the Jewel Box Theatre in Oklahoma City on Thursday. Hitchcock’s original movie is from in 1935, making it 78 this year. Hitchcock loosely based the film on a book by John Buchan, and it has now been adapted for stage by Patrick Barlow. Jennifer Teal directs this comedy/thriller in which four actors play 150 characters, one of which is a man who brings home a thick-accented woman who claims to be a spy. But then she’s murdered. Shows run through February 10th and occur every Thursday through Saturday evenings at 8:00 p.m. There’s also a matinee showing every Sunday afternoon at 2:30. The Oklahoma City Museum of Art has a selection of short films from the 2012 Sundance festival this weekend. A number of the short films being screened this week won awards at the festival. “The Arm,” winner of the Short Film Special Jury Prize for Comedic Writing, is about a boy who tries starts a texting-based relationship with a girl he meets at a yogurt shop. “Fishing Without Nets” tells the story of Somali pirates. Only in this film, the narrative is told from the pirates’ perspective. For a complete list of films and times, click here. The 43rd International Finals Rodeo also comes to the State Fair Arena this weekend. Performances begin Friday evening at 7:30. Watch the top cowboys and cowgirls from the International Pro Rodeo Association as they vie for the World Championship titles in eight events, including tie-down roping, barrel racing and more. The last competition begins Sunday at 1:30 p.m.
And the City Arts Center in Oklahoma hosts its annual “Art Now” exhibition starting on January 21st. Art Now displays pieces from top Oklahoma artists. The City Arts Center also invites attendees to its gala on January 25th. There, visitors will have the opportunity to mingle with over 20 artists from around the state while enjoying food and live music. The gala is for adults 21 and over. Find more information on events in your area on our calendar page.